If you’re interested in finding free activities to keep yourself entertained in Rapid City, simply continue reading to discover 10 fun free things to do in Rapid City! 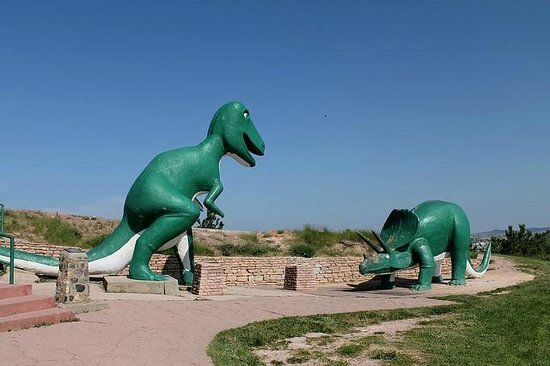 If you enjoy taking and sharing fun, unique photos, it’s well worth visiting Rapid City’s famous Dinosaur Park which boasts seven life-size statues of popular dinosaurs. As an example, you’ll be able to take a selfie with a massive Tyrannosaurus Rex statue and pose next to a Brachiosaurus statue. Whether you are a parent or are simply a kid at heart, it’s well worth making a trip to Storybrook Island, which is free to visit and the perfect attraction to visit if you’re on a budget. Like Dinosaur Park, Storybook Island is teeming with sculptures. Examples of some of the sculptures which you’ll come across include Winnie the Pooh and Cat in the Hat. It’s well worth visiting the Mount Rushmore National Memorial at least once in your lifetime as its one of the USA’s most recognizable attractions. In fact, each year over 2 million national and international tourists visit Rapid City to see the Mount Rushmore National Memorial which boasts the faces of Abraham Lincoln, Theodore Roosevelt, Thomas Jefferson, and George Washington. Four of the USA’s most respected presidents. The Stavkirk Chapel sticks out as it is an exact reconstruction of the iconic Borgund Chapel, which is located in Norway and is over 830 years old. If you walk around downtown Rapid City you’ll come across 33 life-size bronze statues of various American presidents. If you’re keen to track down all 33 statues, do yourself a huge favor and pick up a sculpture map from Rapid City’s information center. By walking around the Cleghorn Springs Fish Hatchery you’ll be able to view trout at each stage of their development. You may also be interested to know that the Cleghorn Springs Fish Hatchery breeds and releases 1 million trout per year. The Museum of Geology is free to visit and displays a multitude of ancient bones, fossils, and minerals. So if you have an interest in geology, nature or history, it’s definitely worth visiting the Museum of Geology. If you have an interest in historic planes or space exploration, you’ll be able to spend a couple of hours exploring the South Dakota Air and Space Museum. If you enjoy spending time in the great outdoors, grab your walking shoes and take a scenic walk around Canyon Lake Park. A picturesque park, which is popular amongst locals and tourists. Art Alley is a unique alley which has been decorated with graffiti based artworks from a wide variety of talented local and international artists. So if you’re looking for free entertainmend in Rapid City, it’s well worth visiting the fun attractions which are listed above.